There are some old Potato Chips companies and there is Good's. Ralph's Good first made Chips in 1886. Despite adding this style of Chip in the late 1920s, he used the original Home Style Chips packaging design and changed the color. So, when you see old fashioned packaging like this from the 1920s and 30s, it would be fair to say it is dated. This however, is the history of the world's favorite snack food right here. Hopefully they will never change it. Thicker than Good's Home Style Chips, so they are firmer to the touch and crunchier to the bite. Not as thick as some more modern varieties, but they certainly stand the test of time. 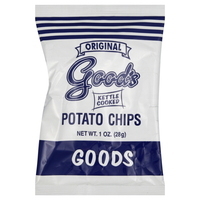 Good's Kettle Cooked Chips differ from the Home Style version by not just the cooking method. The tiny bubbles are from the relatively quick frying system, but they are thicker. The Chips are curled at odd angles, but there is little in the way of grease or residue visible. It is not often we will get to eat a Chip drenched in 5g of saturated fat these days. Remarkable, when you consider how prevalent they were just a decade ago. A more health conscious world should however include Chips such as these, if just for historical or novelty value. The lard gives the rich potato a different, warmer, more tasteful flavor, but it is most definitely an acquired taste.